Since I settle in Germany, I have slowly learned about environmental protection, organic, recycling and reuse, and implemented these slogans into daily life. When I first became a housewife, for me, the most important thing for home cleaners was the "cleansing power." A few years ago, one day, my the other half came back home with a full shopping bag and introduced me to the purchased products: "These are natural ingredients cleaners, for the kitchen, bathroom, and the laundry. Give it a try." I was grateful, and I appreciated that he also wanted to protect my hands with natural cleansers. "Although the natural products are good for your hands, they are also good for the environment. These cleansers are not harmful to nature after they are discharged into the sewer." He looked at me with a joking look. You can see that I didn't have any idea of environmental protection at the beginning. Since then, all house cleaners at home have been replaced with organic products. Also, in recent years, we have gradually found natural beauty care products, and the old ones have all been replaced one by one. However, although these found brands have the concept of sustainable environmental protection, the cleansing power is also indisputable; but most of them are boring in the scent. 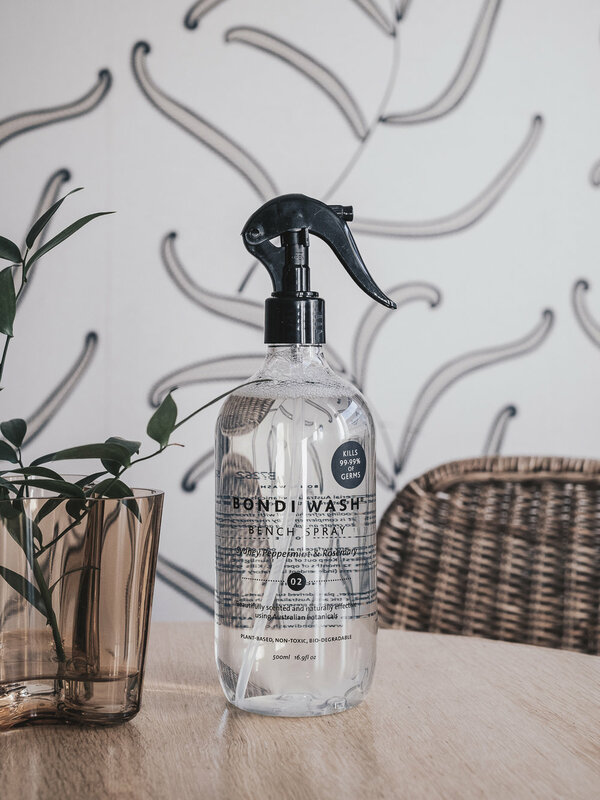 After receiving three cleaning products of BONDI WASH from 10/10 HOPE, I completely changed the inherent impression of natural ingredients cleaners: the natural and organic products can be improved, so that they smell so good. At home, we cook and wash dishes three times a day, so I try the "Dish Wash Lemon Tea Tree & Mandarin 03" first. I cleaned the old dishwashing bottle and placed it into the cabinet, and then set the new BONDI WASH. The transparent packaging and the elegant bottle design make the small corner of the kitchen beautiful. I reminded the other half and my daughter that the BONDI WASH dishwashing has a high concentration and good quality; it is enough to squeeze a little bit each time. Usually, I wash the dishes, and my husband wipes the dishes. But before we switch off the light in the kitchen, he is responsible for washing and cleaning the rest of all glasses and plates. After changing the new BONDI WASH for a few days, I asked how he feels. "It’s good to smell. Whenever I wash the dishes, I want to take a deep breath. After washing, my hands won’t get dry or rough as before. And, just a little bit is enough; at first I thought you were stingy. " He never misses an opportunity to joke with me. 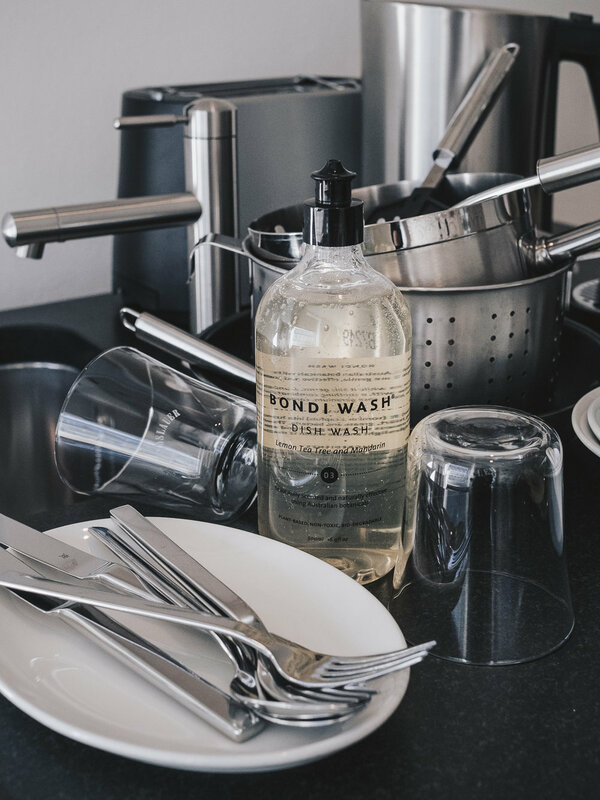 However, my experience is the same as his; when I use the BONDI WASH, I feel that washing dishes is enjoyable, and it seems to upgrade the position of a housewife to a premium level. Elegant is my first impression of BONDI WASH. The fragrance level designed by the brand also has the same great form; these are things I could not imagine before. After using this "Bench Spray Sydney Peppermint & Rosemary 02", the fragrance is as pleasant as a high-grade air spray or perfume. It makes me always want to hold the bottle to spray and clean at home. The nozzle design is handy; I first used to wipe the windowsills in the bedrooms, my beauty desk and wardrobe doors. The ingredients have such as Sydney Peppermint, Rosemary, Juniper, and Sweet Orange; it is a neutral, earthy design. After wiping the floor, "the whole bedroom exudes a Zen taste" was how my husband described to me. Such as BONDI WASH introduces on the product page: Can be used on all types of surfaces including most fabrics. I clean the bathroom countertops, windowsills, wood cabinet panels, cooking areas, etc. with this Bench Spray. Finally, a bottle of natural cleanser keeps my daughter from frowning when I clean. "Floor Wash Sydney Peppermint & Rosemary" was the last bottle I started to use because of the different habits of cleaning. The instruction shows: Use a portion of the lid to blend with a bucket of water. However, I am used to cleaning by spraying, and then wipe it with a wet rag. So I bought a small spray-refilled bottle and mixed a portion of the lid with 150cc filtered water and use it as a handy floor cleaner. I place it in the storage cabinet under the kitchen counter. I wipe the floor after cooking. The kitchen is always clean and fragrant; it is a kitchen with a Zen flavor. I also clean the floor in the bathroom with this mixed bottle after vacuuming the apartment. In the morning light, the dark tiles in the bathroom are shining, which is the biggest achievement as a housewife. This blending amount (mixed with 150cc of filtered water in a portion of the lid) can be used in about one week and then refilled. It is efficient for me to clean. I recommend this idea for you. "Laundry Wash Tasmanian Pepper & Lavender" is on my wish list. I can imagine the harmony between pepper and lavender, and a good mood when I put on clothes every time. Also, the Lip Balm and Purifying Night Balm in the "Buddhawood & Blackcurrant" series also caused my interest. After reading the product description on the website, I felt like I can sleep well after applying the Purifying Night Balm. I will share with you next time. This post was written in cooperation with 10/10 HOPE for BONDI WASH. Even though, we give our own opinion uninfluenced. We had full rein over text and content of this article.